Starting today, BarelyVogue is going to bring you some inspirational stories to uplift, inspire and add a little extra intention to your everyday. We are starting this series with Kalpana Rajesh, founder of Pellipoolajada, who designs floral hair accessories for Indian weddings. I have been following Kalpana’s immensely successful Pellipoolajada page for some time, and I admire her journey so much that I invited Kalpana to speak to BarelyVogue to share her story and passion behind her successful business.After being in the “traditional path” of working as a chemical engineer for years, Kalpana founded her hugely successful business. Today she will be sharing openly and honestly about the high and low points in her business that have guided to where she is and who she is today. I truly hope this story of hers will inspire you to make that shift in your life, business or career that may seem risky and non-traditional. BV: Tell us how this amazing journey of yours started? Were you always interested in floral decorations ? 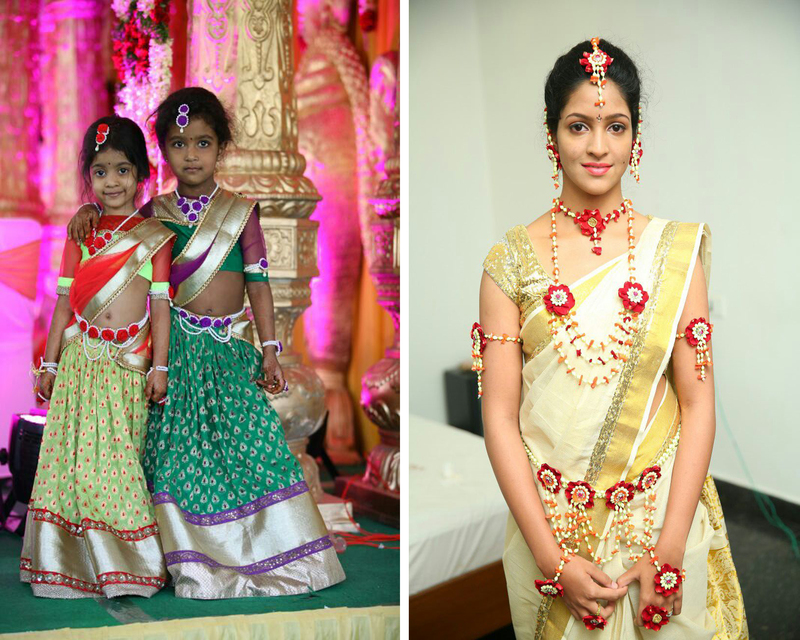 Kalpana: When I was working as a chemical engineer and pregnant with my second kid Murari, I was bored and wanted to do something creative, but wasn’t sure what I was going to do. Just then I read an article in sunday paper about poolajadalu, out of curiosity after the article, I took it to google. I found very few designs and noticed people appreciating the designs a lot. Was surprised to see so much appreciation for those mediocre designs. Growing up my mom used to stitch really nice poolajadalu for us and kids in the neighborhood. She was really good with them. One day I asked my mom to stitch some poolajadalu to upload it onto web. My mom who was working at that time refused stating they take too much time, but she offered to help if I do. Which is understandable, because each and every piece has such intricate details and takes from seven to eight hours to put together. BV: How did you get you first order, how did that go? Kalpana: For my sisters wedding my mom did her hair. I sent that picture to my first customer when she contacted us for designs, she had two months for her wedding then. She liked the design, but wanted to see more designs to choose from. I did not want to let go the first client, so I decided to take the risk. From my salary I kept 50K rupees aside, bought some accessories, and got some workers and started stitching poolajadalu. At the beginning, we did not know even the basics like what the length and width should be or how to make garlands and basics of business. We used to go to flower market everyday, buy our flowers and experiment. I wasted so much money and lost that 50k, but then I gained my first customer and everyone loved the designs. I think when we don’t know the logics and rules behind doing something, we use all our creativity to make it work. I believe best things come out that way. BV: How do you think media and social media helped in your business growth. Kalpana: I was getting orders through word of mouth and referrals in the beginning, but that process was little slow. Because weddings are seasonal and client referrals again may depend on the season. After being featured in Eenadu news paper I definitely got more orders. Facebook is for sure one of the reasons for my success. I think 3 years ago when I started they have a different algorithm, if one of your friend likes a picture it will be seen by many. Having a unique name with creative and good designs, our page attracted more people and we got appreciated. 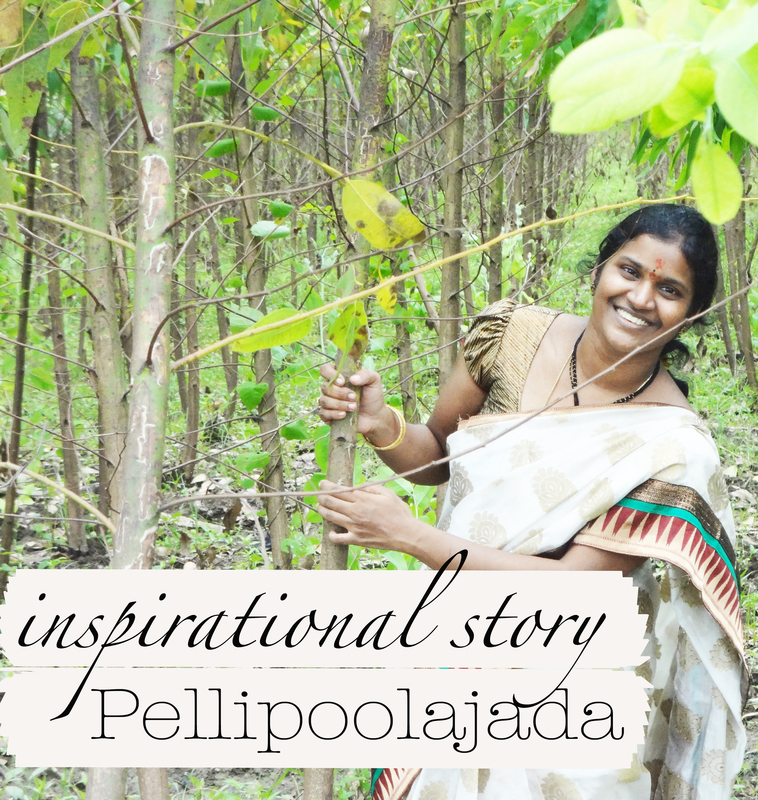 BV: Now Pellipoolajada is a brand. I see that you have more than 30 branches in India . Internationally you operate in Singapore, Boston and Texas. How did this immense growth happen? Kalpana: Initially I was taking care of everything alone, but we used to get many orders from various places to deliver to their cities and towns. Weddings mostly take place in towns even though every one live in the cities. It was hard to deliver when we are dealing with fresh flowers. Their shelf life is less than 6 hours, also at that time I did not even know the basics of packing flowers for shipment. I started thinking about opening branches, at the same time my article got published in Eenadu and at least 100 women enquired if I can train them. However, out of hundred I only had one person Gayatri from Vijayawada who came forward. She got trained and opened her own branch and is now doing good with the business. About USA, I initially used to ship poolajadalu with artificial flowers to USA through a courier service called NRIS helpdesk. Later on I encouraged NRIS helpdesk to take a franchise because business rules are different in every country and I did not want to deal with that. They are also building my Pellipoolajada brand in 14 states of USA. BV: So does these branches operate independently? How did you choose the people to own these branches? Kalpana: Half of them took training from us and half of them worked for me for more than a year. With too many orders to deal with it became hectic. I encouraged my workers to move to different places and run the branches. Three of them came forward and now they own branches in different parts of Hyderabad, some of them wanted to move to their native places. They are not educated, they only studied until 5th or 6th grade, one of them moved to Guntur and the other to Nellore and now they run those branches. My maid got inspired seeing us and moved to Kurnool and now she runs her own branch. BV: How inspiring! Are you a Franchise model now? How does that work? Kalpana: Every season I used to be so overwhelmed that I wanted to sell the business and run away. At that time one of my husbands friend suggested us to adopt franchise model. He explained the process and help us set up, now we have a voice recording service where we track the total number of orders that we get. We closely monitor orders and complaints through that. We also share new ideas and designs with each other, some branches are very creative some are not that fast, it really helps to share our thoughts with each other and brainstorm. We have a whatsapp group where we discuss all the design ideas. BV: How big are you as a business now? What is your man power and how many orders do you deal with? Kalpana: We at least work with 500 hundred orders every season, Initially when I started my goal was to make profits that match my salary. Later I realized it is not just me, there are many people dependent on me and I thought I should take unity of them. Once I stopped looking at it as just money, business was really fun. I don’t really make much money from all the branches, I just get 10%. But I feel very happy and content because all our workers are women other than two delivery boys.They are all lower middle class and poor people. They all work extremely hard day and night, you will be amazed if you come to our workshop and meet them. Just in LB Nagar branch we have around 35 of them, overall we have around 100 workers, my team of franchise owners is 35 and we have 2 people on marketing team. And my husband also helps. So we are close to 140 people. BV: WOW! how amazing. Have you ever thought you will grow this big? Kalpana : Not even in my dreams. I don’t have business background, and everyone discouraged me initially. My mom said you can’t do it because it’s hard to stitch alone as it takes hours. My husband set a 50K limit for me to experiment with, I lost all that money and had to let go one of the big orders at that time. One thing that gave me confidence is I am educated and I have a job. I took courage to experiment because I was not completely relying on just this business. If I fail, I had a confidence to survive with my job. Also, I worked hard for it and used technology to send pictures with whatsapp, social media and match colors when needed. So it all worked out. But never thought it is going to be this big. BV: With the growing business you also need to deal with unhappy clients, how often do you have to deal with them and how do you resolve? Kalpana: Yeah definitely, we get 1% complaints. How much ever we work hard we will have that smallest percent of unhappy clients. At least 90% of that 1% we try to replace or fix things to make the client happy. But we still have one or two people who are unhappy. However we take these complaints very seriously, before we used to write things down on a pen and paper. Now we have a streamlined process for everything starting from order to delivery, we really scrutinize and analyze each and every complaint. If we get one complaint we send it to all our branches to make sure that won’t happen again. So the possibility is very low, but it may happen very rarely. BV: What would you suggest other women who wants to do something they are really passionate about but are scared to take that risk? Kalpana: Most of the women I see wants to do something, but it is not very easy for them to come out of their homes, comfort zone and cross that initial obstacle. Jobs are much easier, they are 9 to 5 but for business you have to work 24hours. Everyday I meet lot of women who wants to come and train with me. But last minute they won’t show up. They give reasons like their family not being supportive. But the truth is they don’t have that courage. They always think in terms of investing certain amount of money and the risk involved in getting that back. Most of the successful business women I meet are very strong and have stood against all these odds and crossed the barriers. I really encourage todays women to take that courage and do what they truly love. It is very fulfilling to do what you are passionate about and also help other families. How do you like this post? Do you have an inspiring story that we should know? We would love to cover, write to us at sahi@barelyvogue.com or leave us a comment in the comments section below or meet us on Facebook or Twitter. I just want to know where is ur branch in kurnool plz send me address.